CHILLS Green 1 1/2 Slow Burn HEMP ROLLING PAPERS. TWO PACKS. Details about CHILLS AMERICANA TWO PACKS 1 1/2 Slow Burn HEMP ROLLING PAPERS. 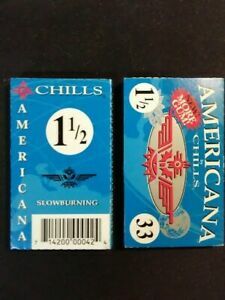 CHILLS AMERICANA TWO PACKS 1 1/2 Slow Burn HEMP ROLLING PAPERS.